Beijing Haolaifu Science & Trade Co., Ltd. is committed to the R&D and manufacture of adult products for international markets. Through making full use of the information resources both at home and abroad, and sticking to the management philosophy of unique product designs and top quality, our company will sincerely provide safe, outstanding and innovative products and most excellent services for customers. 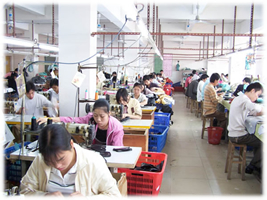 Our company boasts the advanced manufacture equipment and exquisite techniques, and strives to constantly design, manufacture and upgrade the new styles of products. At present, we have leather series, male self-satisfied products, phallus for female, electric or non-electric rectal suppository, yang strengthening products, conception control or testing products, male or female sexual underwear, weight-reducing medicines and other series products. They are characterized by excellent quality, low price, fine craftsmanship, special style, and innovative designs, thus being one of pioneers of adult products in China.